2012 was a big year for me. I had more freelance projects booked in than ever before, a fairly full load of regular teaching gigs, and three overseas conference presentations . If you take a look at my Project Diary page you can scroll down and see what was on in 2012 – and this list doesn’t include teaching full days in 2 schools and 2 universities (I taught one of the university courses online and in the evenings, as my students were in the USA and Canada). It was a very satisfying year professionally, with a number of new ventures, including the opportunity to work in north-western Australia with the Australian Chamber Orchestra, and running my own series of workshops at ArtPlay. But it was a tricky year in terms of finding balance. I felt like I never stopped working! 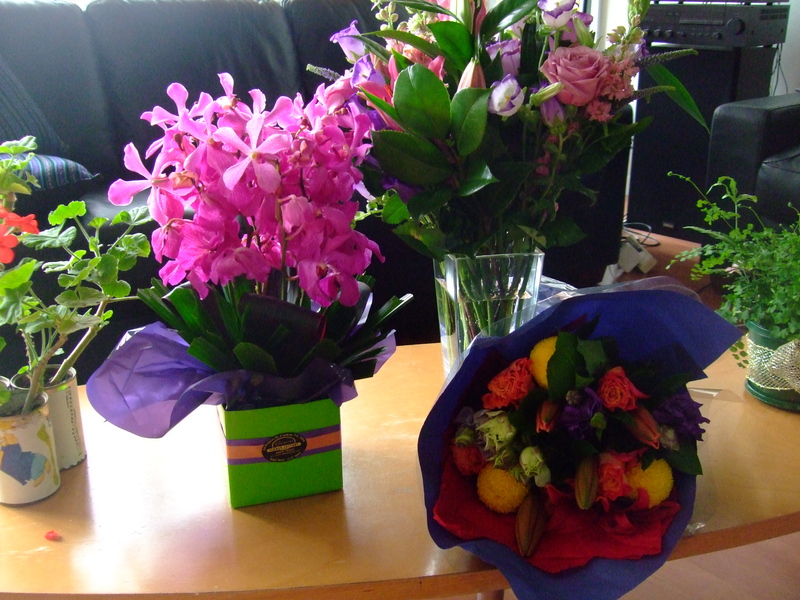 ‘Farewell’ flowers given to me at the end of term by my two schools. I am looking forward to a different pace and focus in 2013. The big change is that I am starting my PhD this year. Next week I will be heading up to Brisbane to meet with my supervisors and will officially be a student again. To make space for full-time study, I resigned from my two primary schools at the end of 2012. In some ways it was sad to say good-bye – I’d been at the Language School since 2005, and even though students were constantly arriving and leaving (it is a transitional school), I’d developed longterm relationships with the teachers, and built a really lovely, hand-picked collection of instruments. I’d been teaching at Pelican Primary School since 2009 for 2 days a week, and the children who’d been in the younger years when I started were now heading into the senior classes in the school. It is a wonderful thing to observe a cohort of children growing like this. I’d built relationships with parents as well as with teachers, and it was sad to let those go. At the same time, I was feeling restless. I’d started the year feeling that I’d “done lots of this before”. I found it more and more difficult to feel patient with the kind of frustrating timetabling issues that arise in primary schools everywhere that can really impact specialist programs. I loved the children, and loved playing music with them, but no longer felt as energised by the teaching work. Moving on at the end of the year therefore felt quite liberating. There is a great momentum that comes with being at the beginning of something. I’m excited about my PhD topic (looking at music education and participation in post-conflict countries around the world), and about starting a new research project, which I find stimulating and inspiring in similar ways to creative project development (I’ve blogged about the commonalities here). And even though all of those who have already been through the PhD journey or know someone who has, shake their heads and say things like, “I hope you survive, it’s a lot of work!”, I feel undeterred. In fact, I feel relieved to think that no matter how much work it is, it will at least be just one big project, rather than the many multiples of projects I had in my head in 2012, all unrelated to each other, each needing their own amount of space and time. Having one thing to focus on for the next 3-4 years seems like a really straightforward proposition at this point. (Though perhaps I should revisit the optimism of this notion in 6 months time!). 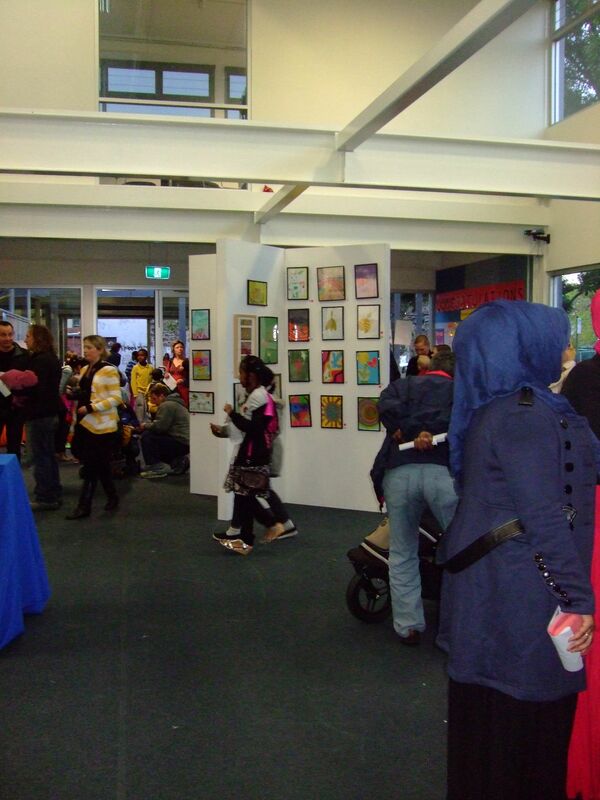 Last Thursday night was Pelican Primary School’s first ever Art Show. 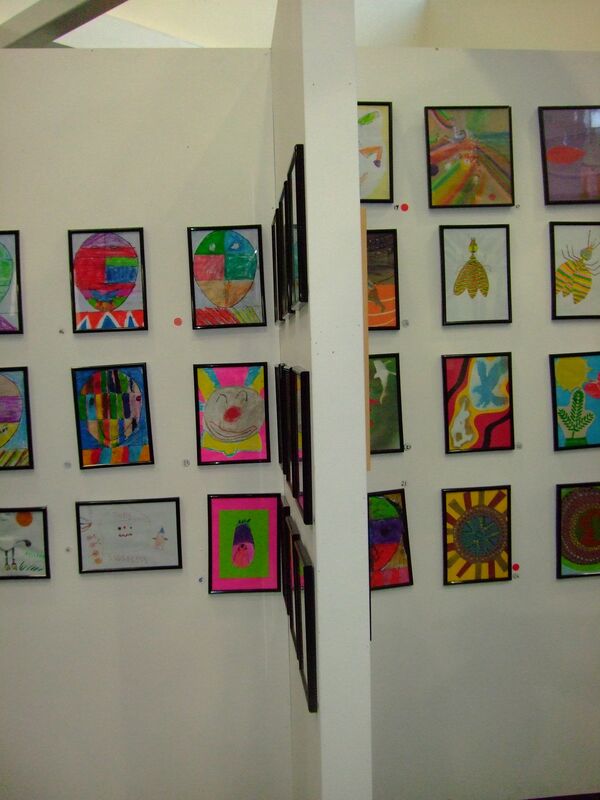 An artwork by every child in the school was framed and on display. It was a huge effort by the staff team to get all the framing done in time. The year 5 and 6 students were in charge of hospitality, and walked around with platters of finger food for everyone to try, some made by the students in the Kitchen Garden classes, some made and donated by local restaurants. 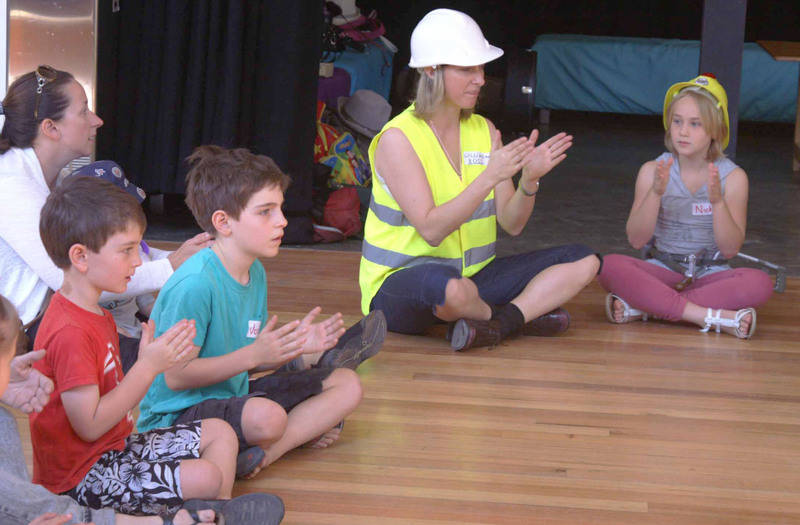 These events are important for many reasons – they display the talents and visual expression of the children and show the range of interests and ideas, and they bring the parent community into the school. It can be difficult to draw refugee and immigrant families to the school on a regular, ‘helping-out-in-the-classroom’, ‘running-the-sausage-sizzle-on-election-day’ kind of way, because for many of them, school is about their children and expectations of their children. Building stronger community links and parent involvement can be a big challenge. Events like the art show encourage the parents to participate, make them feel welcome, and hopefully make them feel proud of their children, and connected to the school community. There are some true artistic souls in the school, children who have a way of expressing the complexities of their feelings and sense of identity. 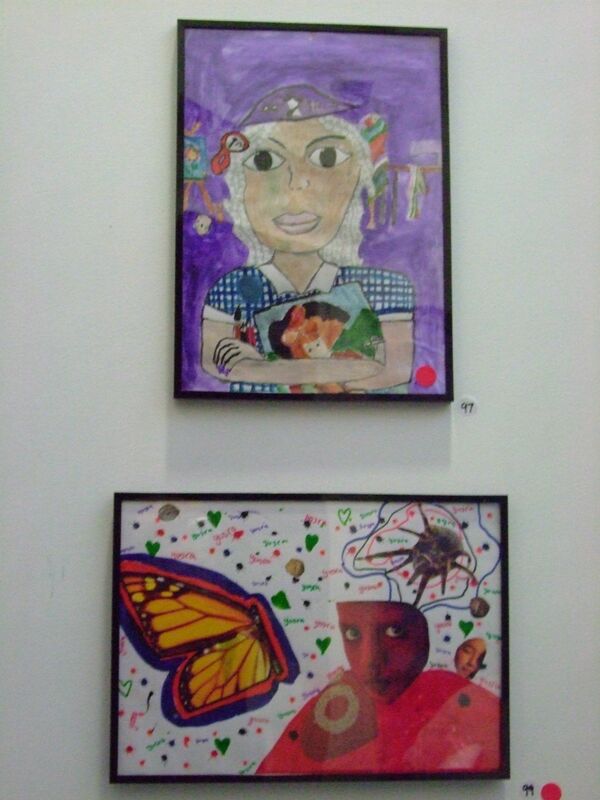 I loved the two artworks pictured below, both by girls in grade 4/5. The upper picture is incredibly detailed and my snapshot will not do it justice. Notice the items she is holding – pencils, a book, dolls. And notice her hair is in fact strands of tape measure. And the look in her eyes – I see a desire for challenges and extension and opportunities, and at the same time an anxiety about the future. The lower picture has a wonderful insouciant energy – I love the sense of defiance and sense of lightness and possibility she conjures up with her choice and positioning of images. Parents had the first option to buy their children’s work ($5 each). The parents of the child who did the painting above weren’t present. A bidding war started up among the other adults present – it was a very popular work! In the end it was bought for $50 by the parent of one of the girl’s friends. But she took the young artist aside to tell her, “Do you want this picture? I bought it for you – you can take it home with you.” But the child decided she wanted it to go home with her friend’s mum. I fell in love with a picture by one of the Prep children – a child I don’t teach. His parents weren’t present so I got to buy it at the end of the evening. It is leaning against the wall in my study, a pastel blend of rich orange and yellow, merging into a lower strip of blue (mixed with glimmers of yellow), with an angular pink shape in the middle of the yellow, and the child’s name – YUSUF – written down the right hand side of the page. “I asked them to do a picture of something lying on the sand at the beach,” the art teacher told me. “The pink thing is a shell.” I love it. My students think I know Lady Gaga. As in, personally. In fact, they think I have her on speed dial. “I don’t know,” I said, shrugging (I really didn’t want to get sidetracked down this line of questioning when I know so little about Lady Gaga). “Shall I ask her when she comes to our school?” They gave sudden squeals of surprise – was Lady Gaga coming to our school? When? “In fact,” I continued, amazed at what I seemed to be getting away with, “Why don’t I just call her now and ask her?” To an accompaniment of even more excited screams I took my mobile phone from my bag, pretended to press some numbers, and put it up to my ear. I motioned for the group to be quiet. At this point they were all staring at me, eyes very wide. A couple were smirking knowingly or rolling their eyes. At this point the choir began screaming – really screaming, with excitement – and calling out messages. One boy was saying determinedly, “Not me! I don’t like you at all. Not me!” but all the others were screaming messages of love and devotion, grade 3 style. I gestured to them to be quiet. “Anyway Lady -” I’d realised I didn’t know what to call her – “the kids here have got some questions for you. Have you got time to answer a couple of questions?” Again, I paused and then nodded at the children who started waving their hands in the air. “Ummm, why do you take your clothes off and show your body to the world?” asked one of the boys primly. I nodded and relayed the question into my phone. Lady Gaga’s response? “It’s because she gets so hot when she’s dancing. She gets hot really easily.” Right. There were a couple more questions, but the excitement was starting to get out of hand, so I pretended she’d just told me she had to go. We all sang out a jolly good-bye to her and I told her I’d see her on the weekend. Clearly, as their music teacher there is nothing I can’t do. Choir was dismissed a minute or two before the end-of-school bell rang, and even in that short time the word had spread. “Gillian, did you know that Lady Gaga is coming to our school?” a child from another class asked me as we walked down the stairs. Hafsa looks a bit embarrassed to be singled out, but says in a small voice, “It’s because of cow-dung!” and she and all her friends all start giggling again. Brick. Plant. Rock. Concrete. Glass. Cow-dung. Mud-brick. Bamboo… Tarpaulin. Steel and wood. Normally at Pelican Primary School’s choir practices, we keep strictly to task. At that time of day, too many transitions or moments of ‘down’ time can mean the end of any concentration, so I keep the teacher-talk to a minimum. But on this day, the question of cow-dung gave us the opportunity to have a really interesting conversation. A few people offered their thoughts, and one identified the common theme – these are all things you can build a house with. 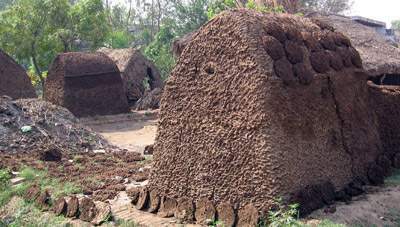 “A house from cow-dung? That’s disgusting!” they all chorused in delight and disgust. I described some of the houses I’d seen in Timor-Leste, where all the different parts of the bamboo plant were used – the sturdy trunks would be used for the frame, thinner trunks or branches sliced longways would be tied tightly side-by-side to make the walls, and the long stringy leaves would be intricately woven and thatched to make a strong water-proof roof. They were fascinated by this description and sat quietly, picturing these houses. “But the people live in small communities, where they know everyone. They all work together and help each other, and so they trust each other. The moment someone new arrives in the village, they would all know about it, and be watching carefully. Knowing each other well like this helps to keep their houses safe,” I explained. One boy at the back of the altos then shared a story about helping to build his family’s mud-brick house when he was living “in Africa” (he’s lived in Burundi and Kenya as a refugee and maybe some other African countries as well). By now, they were all completely sold on the idea of a cow-dung house and they sang their hearts out for the last few minutes of the day. I think this was my favourite choir practice of the year so far. Back at Pelican Primary School for Term 2, and the year 4/5 class are continuing to develop their arrangement of Gotye’s Somebody I used to know. This first week back, we revised what they remembered of the opening melody, and started to develop an accompaniment figure. I stopped the singing on the word/syllable immediately before the pitch we were trying to identify. There was an exciting moment when I realised they were all hearing the missing note in their heads and starting to visualise or ‘map’ its direction. It was suggested in the way a large number of them all called out the right answer at the same time, after a moment of silence that was as long as the missing note would have been. I was so thrilled by this development! I knew that the challenge on the marimbas would be to go from the note D to C with the left hand – I anticipated that they would instinctively continue a left-right-left-right mallet pattern and would thus struggle to find the C. Therefore, I told them to use their left hands to touch D and C, and the right hand for A and G, and got them to practise this in a focused way on their bodies. We practised the gestures together as a group. Then I set up the xylophones and marimbas and a small number of students got try out the accompaniment pattern. I think this proved to be a helpful step. In any case, with this kind of group task, we only need one person to figure it out – they can then model it for the others, they will learn by watching, the watching will also help create a visual memory for them, and hopefully the body-contour work will help create a physical memory. We’ll see! This class is such an interesting group. They always come in scowling, sneering, and with a lot of bravado towards me, my co-teachers, and especially towards each other. But they do take their learning quite seriously. Enough of them are motivated to create something of a critical mass, so we make progress, most weeks. My plan is for this Gotye piece to be ready to perform in 3 lessons time. Is this the best name game ever? The following warm-up game is one that I have been using since I first started training in musical leadership at the Guildhall, oh-so-many years ago. It is a simple name game, but its simplicity belies the depth of its messages I suspect! I call it Names in the Space. the skill of timing your voice to land at a certain point in the rhythm. But more importantly perhaps, it is a demonstration that every voice here is important. Everyone has a chance to speak. Everyone’s contributions will be affirmed by the group. It also establishes a group focus and settles the group. 'Names in the Space' being played at the recent Music Construction Site workshop. I find that for many of my students, pitch is the most intangible, hard-to-grasp concept of all the musical elements. 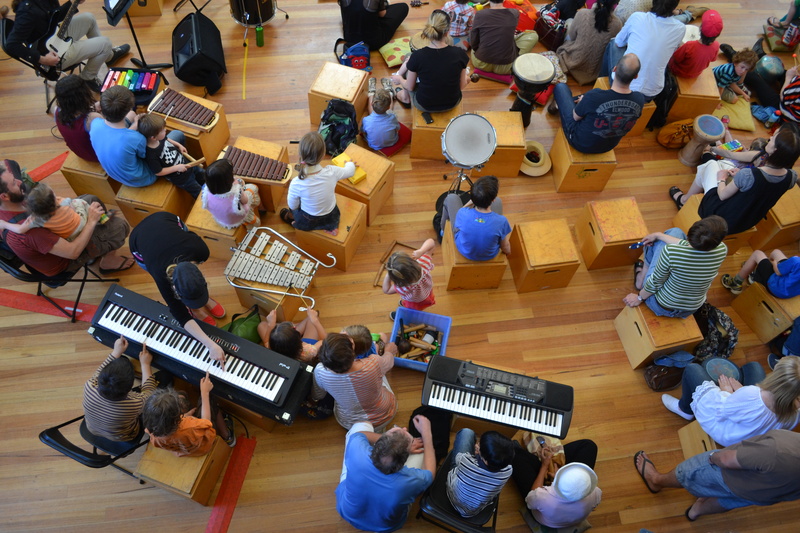 I’ve experimented a lot with different ways to help children make sense of it and to get greater satisfaction from working with pitched instruments. Rhythmically the students are usually very strong, but I think that multiple pitches (indeed, multiple sounds) are often very chaotic for them. Choir at Pelican Primary School is a hot-ticket item – I have more than half the children from the eligible classes taking part each week (about 40 students all together). They are noisy and rowdy, they take a long time to settle down when they first arrive and to maintain focus whenever we ‘transition’ from one activity or song to the next. Most weeks, 1 or 2 children are sent back to their classroom for distracting or unhelpful behaviour. But they are improving slowly (they are a nice little choir already, but it is their willingness to learn that is improving), and this gives me hope! Last year, for example, we started singing songs in two parts. I divided them into two groups of sopranos and altos, and they have maintained those groups and quite proudly identify themselves with one or the other voice type. Singing in two parts means that I need to give each group their starting pitches before we begin a song. Last year, I would give these pitches, and both groups would ‘over-sing’ them – getting louder, and whooping their pitches up and down to make each other laugh. “I hate it when you do that,” I told them once, grumpily slumping back in my chair, tired of such end-of-the-day silliness. But me hating it meant that I also needed to explain to them the purpose of these starting pitches, how they should respond, and why it was counter-productive for them to move the pitches around. Every week, it was an effort to make this part of the pre-song preparation work, but we persevered. At today’s rehearsal, I gave the pitches for our 2-part South African song, and away we went. I realised later, reflecting on the rehearsal, that they hadn’t done their usual routine. They had taken the pitches, echoed them quietly, and used them to get the song started strongly – the way I want them to. Success! I used to approach all my teaching at Pelican as ‘teaching by stealth’ (my own term) – creating activities that create environments that mean knowledge and understanding gets absorbed. This works well for the slowest and lower-achieving students, but leaves those with more ability and motivation to learn with fewer challenges than they deserve, and with fewer opportunities to put labels on their knowledge. Now I tend to announce to the older classes, “Information! I’m about to give you information! This is important for your learning so listen!” The more able students need this. They thrive on it. They are dying to know things.